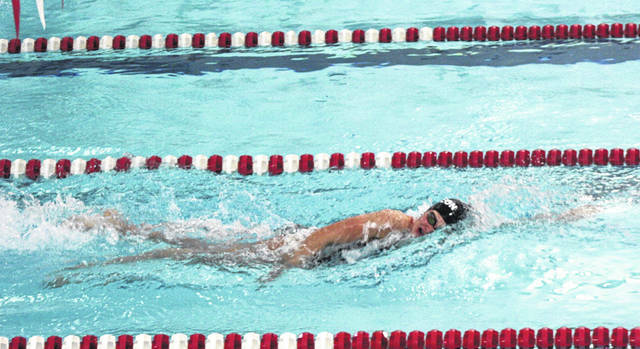 Ryan Scherer of Wauseon swims in the 100-yard butterfly at an earlier meet this season. This past weekend at the NWOAC Championships in Fremont, he placed third in this event. Wauseon’s Brooke Schuette competing at an earlier meet. She was runner-up in the 500-yard freestyle and third in the 200-yard freestyle over the weekend at the NWOAC Championships. FREMONT – Wauseon swimming and diving had both their boys and girls teams place in the top four at the Northwest Ohio Aquatic Conference Championships held last Friday and Saturday at Fremont Ross High School. The boys placed third with 218 points, while the girls were fourth at 236 points. Sandusky Perkins won the boys meet and Fremont Ross took home the girls title. For Wauseon, their boys were paced by Ryan Scherer and Branden Arredondo who placed high in a pair of events. Ryan Scherer was third in both the 200 IM and 100-yard butterfly. 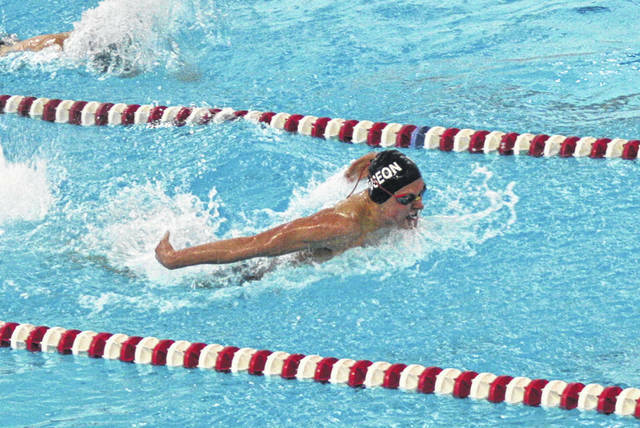 Arredondo was runner-up in the 100-yard freestyle and third in the 50-yard freestyle. The Indians also had a winning relay team in the 400-yard freestyle relay. The quartet of Maddux Chamberlin, Andrew Scherer, Arredondo and Ryan Scherer took first with a time of 3:26.89. At the forefront for the girls were McKenzie Darnell and Brooke Schuette. Darnell was runner-up in the 200-yard freestyle, followed by Schuette who took third. Those results were flipped in the 500-yard freestyle as Schuette was runner-up and Darnell placed third. In diving action, Kennedy Nation placed sixth for the Wauseon girls. Bailey McGuire took 15th and Madi Baugh 20th. Placing for the boys was Cade Smith who finished 12th. Perkins 428, Fremont Ross 395, Wauseon 218, Napoleon 213, St. John’s Jesuit 206.5, Port Clinton 193, Sylvania Northview 173.5, Oak Harbor 167, Bowling Green 163, Sandusky 99, Sylvania Southview 62, Ayersville 1. Fremont Ross 440, Napoleon 416, Notre Dame 237, Wauseon 236, Sylvania Southview 213.5, Oak Harbor 206, Sylvania Northview 191, Perkins 143, Port Clinton 133.5, Sandusky 99, Bowling Green 10. 200 IM- 3. Ryan Scherer (W), 2:07.47. 50 freestyle- 3. Branden Arredondo (W), 23.34. 100 butterfly- 3. Ryan Scherer (W), 56.31. 100 freestyle- 2. Branden Arredondo (W), 51.11. 200 freestyle relay- 2. Wauseon (Case, Hutchinson, Ryan Scherer, Arredondo), 1:33.99. 400 freestyle relay- 1. Wauseon (Chamberlin, Andrew Scherer, Arredondo, Ryan Scherer), 3:26.89. 200 freestyle- 2. McKenzie Darnell (W), 2:00.91; 3. Brooke Schuette (W), 2:01.98. 500 freestyle- 2. Brooke Schuette (W), 5:23.21; 3. McKenzie Darnell (W), 5:28.47. 200 freestyle relay- 3. Wauseon (Russell, Carroll, Schuette, Darnell), 1:45.11. 400 freestyle relay- 3. Wauseon (Russell, Witt, Schuette, Darnell), 3:51.33.